We are happy to announce the release of SQL Enlight version 1.9.9.917. Today we are delighted to announce the release of SQL Enlight version 1.9.9.913. We are pleased to announce the release of SQL Enlight version 1.9.8.907. 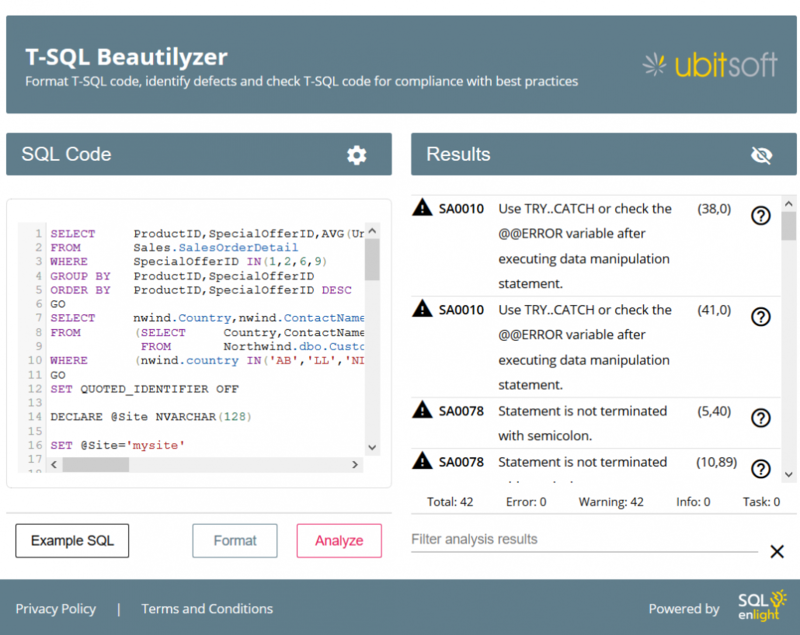 After creating a new versions of the T-SQL Beautifier and T-SQL Analyzer, we decided to combine the both tools in one – T-SQL Beautilyzer. There are several usability improvements in the new version and it is completely free as before. We will to improve the online tool further, so if you have any ideas, suggestions or comments, please feel free to contact us. Thanks for the feedback and we hope you’d enjoy the new tool! We are delighted to announce today’s release of SQL Enlight version 1.9.8.893. We are happy to announce the release of SQL Enlight – 1.9.8.877. We are happy to announce the release of the latest version of SQL Enlight – 1.9.8.874. We are happy to announce the new SQL Enlight release candidate that is now available – 1.9.8.872-RC. We are happy to announce that today we released our new web site. We hope you’d like it! Today we released SQL Enlight version 1.9.8.854 . This update as well as the previous two updates is targeting an issue with SSMS 2016 integration. We found a problem in our installer, related with SSMS 2016 extension installation. The new version that fixes this problem is available here.